The prototypes in this series are all original artwork, layouts, and proof sheet for the Screamin' Model Company's line of Star Wars models released in the early nineties. These represent some of the first prototypes to emerge from the "Dark Years" of Star Wars collecting - the period between the demise of Kenner's action figure line and the release of the Heir to the Empire novel. 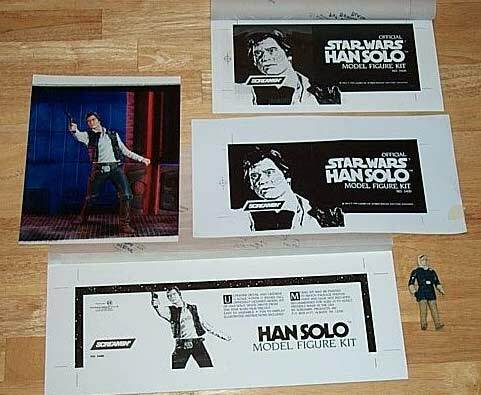 Above are two layouts for the Han Solo box front. To make a layout, the designer basically cut and pasted pieces of art, text, and photography onto a mechanical board. Some layouts also include a transparent sheet with more cutouts pasted to them. Handwritten instructions are sometimes scrawled on the top tissue paper overlay, detailing corrections, additions, coloring, and other such instructions. The image on the left is a color layout and though it's hard to tell from these photos, all the text is on a transparent film in front of the picture. The layout on the left is basically an identical piece in black and white. The picture above shows two layouts (top and bottom) for the box sides and end. The middle piece on the right is a black and white proof sheet. 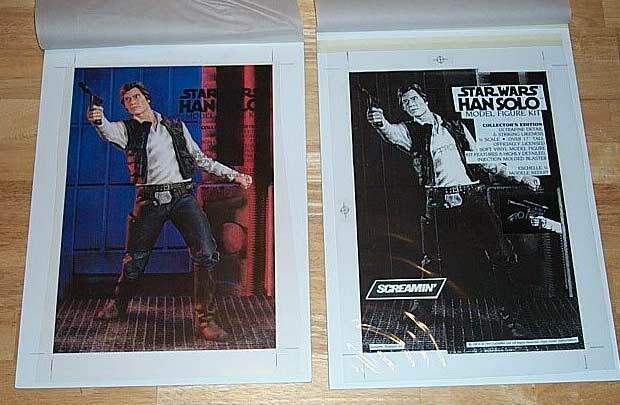 Finally on the left is the original file photography use to make the full color Han Solo box. The 3-3/4" figure is shown for scale.